What do you do when your daughter swallows her first tooth? | Craft me Happy! : What do you do when your daughter swallows her first tooth? What do you do when your daughter swallows her first tooth? Well we knew that a visit from the tooth fairy was imminent. 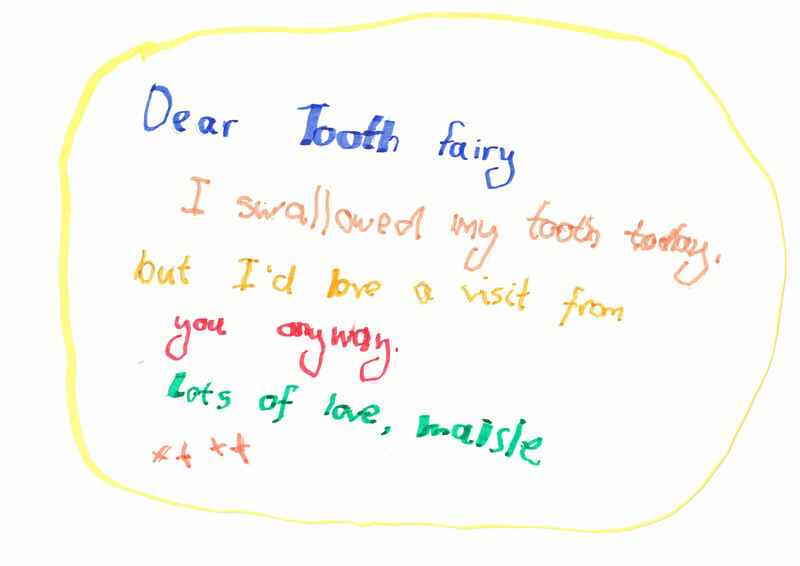 Maisie had had a wobbly tooth for a fortnight, so we knew it could be any day. She was so excited! Then, on the day before Christmas Eve, she'd just finished eating her breakfast and she smiled at me and I saw it... or at least I saw the gap that remained. I realised that she must have eaten her tooth, but we hunted high and low for it anyway. She was devastated, bless her. She's only 4 and a half, so she'd been looking forward to her first visit from the tooth fairy for 2 weeks - fairies are a big thing in our house! I told her that if she fell asleep with a big smile on her face, then the tooth fairy would see that she'd lost a tooth and pay her a visit. Unfortunately Maisie wasn't convinced by this idea and she said she was, "too sad to smile," so I had to think of something else. 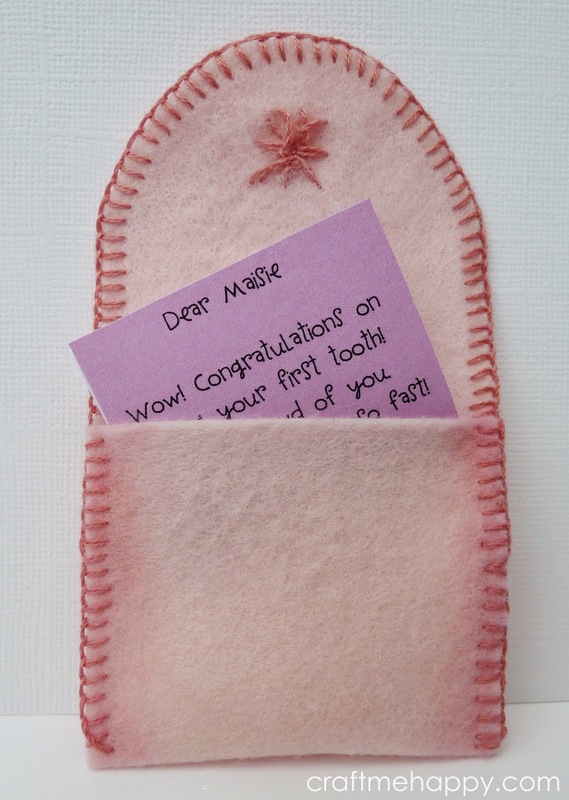 "Dear Tooth Fairy, I swallowed my tooth today, but I'd love a visit from you anyway. Lots of love, Maisie x x x x"
This actually seemed to placate her and she went to bed unusually happy that night. Wow! Congratulations on losing your first tooth! I'm so proud of you, you're growing up so fast! Thank you for your lovely letter, your writing is beautiful! I'm sorry you swallowed your tooth. Never mind, you can keep that one, I have plenty more. Here's a shiny coin to say 'well done'. I'm looking forward to seeing you again soon. I printed the letter using Grace font in 20pt, so the text is quite small and 'fairy like', but big enough for her to read. ... and a letter from the Tooth Fairy needs an envelope. I just drew a basic pattern on paper and then cut it out of 1 piece of felt. 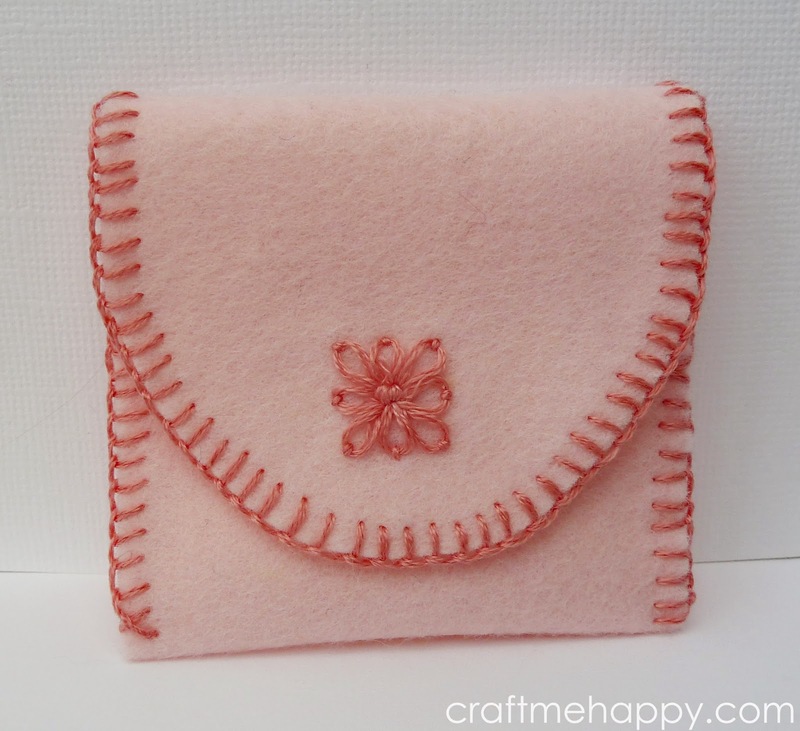 Then I folded it into shape and blanket stitched along the seams and the single edge in one continuous stitch and embroidered a little flower onto the flap. 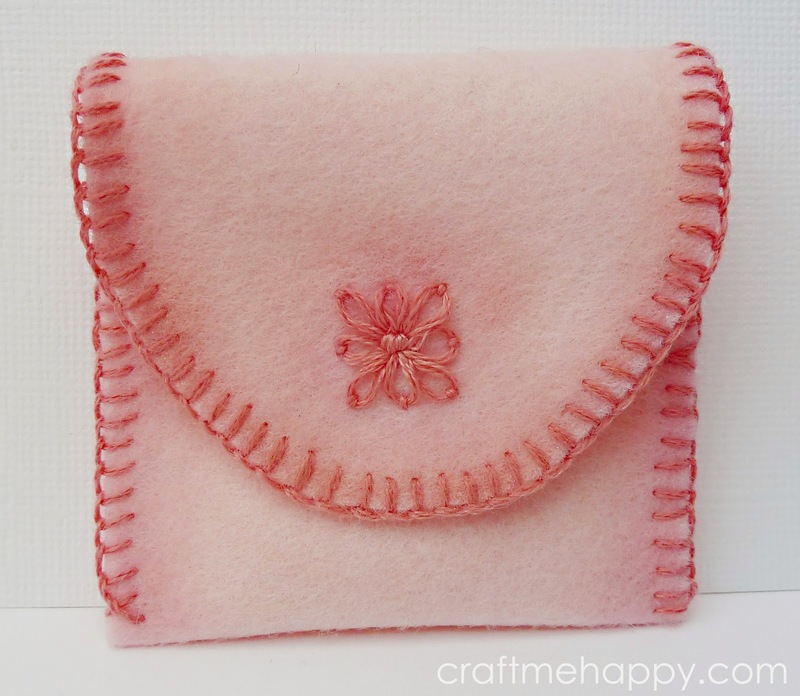 To add a bit of fairy sparkle, I dusted around the stitching with my Dovecraft decorative shimmer chalks. Maisie has since lost another tooth, but thankfully didn't eat that one! She used the envelope to put her tooth in, which we were all very happy about, as it saved us hunting around for it in the middle of the night. Love it! I found your post through craftgawker and am so glad I did. Thanks for sharing! That's such a lovely idea. My youngest daughter swallowed her first tooth yesterday.